Earlier this year I posted about my plans to improve my Ninja Readers Book Club and to also start a storytelling club. However, since then I've been thinking about how I got some of our quieter book club students to come along to the comic club last year and step out of their shells a bit in order to tell stories. I was also thinking about how I missed the opportunity to promote reading to some of the comic club students, the ones who weren't confident readers. So I decided to combine the two clubs and form the Ninja Readers and Storyteller's Club. This hasn't come without its problems. Last year's clubs took place at morning tea but to combine the two and get a little more time I wanted to run over lunchtime. I encountered unexpected opposition, with our older students deemed too busy with other things. I could only take them at morning tea. I went away and thought about it, and then decided to see if I could take the Year 4's at lunchtime instead. The book/storytelling combo needs the extra time and I think I can make it work with younger children. I got the students to sign up - 40 of them! Gulp! Still, I was pleased that it showed the concept was a popular one and I'm sure there will be some drop off as we go along. I decided to meet with them before the term ended so I could tell them a bit about how the club would run, and issue a couple of voluntary challenges for the holidays. Only one of these words and phrases was taken from the book. The rest I made up, keeping in mind that after we share the images I thought we might use them to inspire short stories. Over the holidays I have been doing the scavenger hunt with my younger son and we have both been enjoying it, so hopefully some of the students have too. 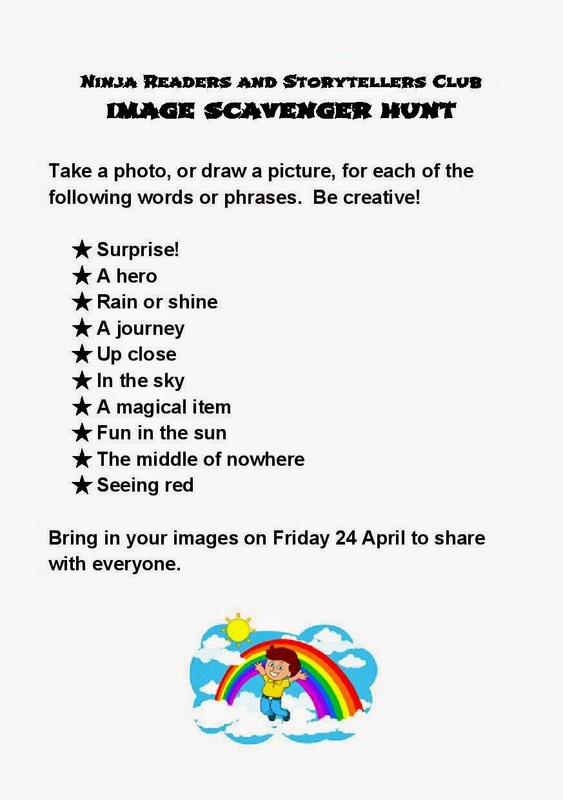 The second challenge was to draw a Nina reader or storyteller so we could make a poster for the club. As an example I showed them the one we made last year for the Moustache Potatoes Comic Club. 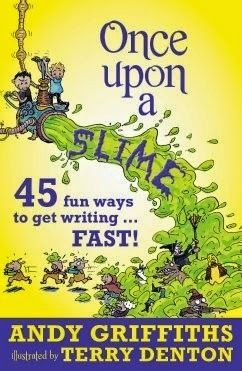 I have spent some of the holidays reading about writing, with my favourite book so far being 'Once Upon a Slime' by Andy Griffiths. There are so many awesome ideas to inspire writing in there. As usual I have spent too much time researching and now I need to pull it all together for next week. I am aiming to use books/genres as the basis for the storytelling projects, while also showcasing the various storytelling apps on the school's iPads. I will let you know how we get on.